Never Leave Your Timeline Again. Put millions of HD and 4K videos and music files at your fingertips without disrupting your workflow. With the free Pond5 Add-on for Adobe Premiere Pro, you’ll save time, stay on budget, and become a post-production hero. Quickly find media with advanced filters like FPS and Resolution. Instantly replace comps with hi-res files when you’re ready. try out (a $1,000 value). Get up and running in minutes following these three easy steps. Click Download Now to go to the Adobe Exchange® marketplace, where you can download the free Add-on. In Adobe Premiere Pro, select the “Window” menu, choose "Extensions," and select the Add-on. 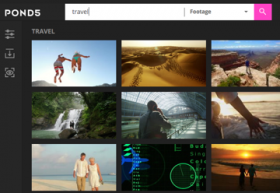 Try the 50 FREE high-quality videos we've included in the Add-on, or use search to find clips and add them directly to your timeline! Ready For A Better Workflow? 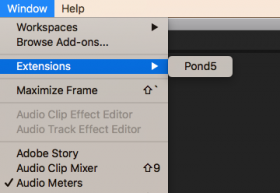 Download the Pond5 Add-on for Adobe Premiere Pro now and start editing smarter.